The World According To Lexi: I Love Summer Because of Things That Fly In The Sky! I Love Summer Because of Things That Fly In The Sky! Lexi, Nitro, Tallulah, Bailey, and I are excited to participate in this weeks Saturday Pet Blogger Hop. Special thanks goes out to our Pet Blog Hop hosts, Life With Dogs, Two Little Cavaliers, Confessions of the Plume!and If you would like to read some entertaining pet blogger posts in the Saturday Pet Blogger Hop, just click on one of the host links above or click on the purple Pet Blogger Hop button on the right side of our homepage. 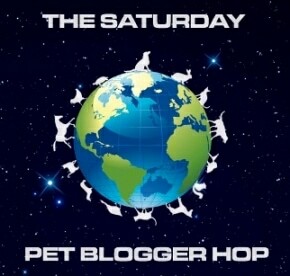 Happy Pet Blog Hopping! My favorite season is summer and so this post is dedicated to summer and things that fly in the sky. Here in Virginia we are having severe thunderstorms almost every afternoon and I have been seeing the most amazing Cumulus (cumulonimbus) Clouds displays I have ever seen in my life. With that being said, I took my new Nikon COOLPIX P500 camera out to shoot these amazing Cummulus Clouds so I hope you enjoy the following displays of Mother Nature's work. What I love about summer is many of the flowers I planted in the early spring are in full bloom in my garden now. I decided Lexi, Nitro, Tallulah, Bailey and I should take full advantage of the menagerie of flowers and flying creatures in our front yard. In the following photos I tried to capture things that fly in the sky in the summertime here on Bluebird Farm. I hope you enjoy them as much as we do. Miss Tallulah watching all the butterflys on my beautiful summer of flowers. This week there were butterflys and fire flys everywhere! Okay they can't fly but they are so darn cute I had to include this photo of Nitro playing with a leaf and Bailey relaxing in the sun. Can you tell the puppy is on the left and the adult dog on the right? I call this shot the "stealth butterfly" because it reminds me of a Stealth Fighter Jet. So pretty (I love my new camera)...Did I mention it is a Nikon Coolpix P500...oh yes I guess I did. Goofball Nitro still playing with the leaf (and still not flying) and Bailey still relaxing. This is the 2011 Stealth model, it is the lightest weight Stealth ever manufactured in the U. S.
The world according to my sweet 10 year old dog Lexi. One of my Peach Geraniums hanging high up on my front porch. Miss Tallulah..she is my perfect little girl (in every way possible). God has blessed me with her. This Bluebird was actually very far away up on a high wire but with my new 36X zoom lens I got a fairly good shot of this little guy. Did I mention I got a new camera...oh yes I guess I did... The Bluebirds are everywhere this year on Bluebird Farm (lots of babies). Big old Bumble Bees on big pink flowers! Okay so I admit that I am a "cloud freak"...I love beautiful clouds and I take photos of them every chance I get. I hope you enjoy these amazing displays of beauty from Mother Nature. Dramatic clouds just make me happy! This reminds me of a painting I once saw at the Smithsonian many years ago. What do you see in this could? Okay so I got lucky on this one. Timing is everything! There was a couple of shots I got through my front car window (no, I wasn't driving my husband Chris was at the wheel) and when I uploaded them they had this pretty teal tint to them from my car window tint. I imagine this is what the gates of Heaven look like. There was a big storm approaching and we were all honkered down in the basement but right before the storm hit Bluebird Farm, I ran out and took this photo of my front pasture before the darkness of the storm hit. I love the contrast between the dark and light. According to my dog Lexi, she wishes you all a very dramatic and fun filled summer. Enjoy the fireflys! Ohhhh myyyyyyyyyy!!! Your photos are simply exquisite!!!!!! They have me speechless! The flowers, butterflies, your babies, the thunderheads/cumulus clouds...ALL OF THEM! Stupendous! Okay. First, I want, I want, I want your new camera. Holy moses! Awesome pics! Second, it is soooooo nice to meet another cloud freak. I take pictures of them ALL of the time too. I am fascinated by their various shapes, sizes and shadings of color depending of time of day and if they are about to produce a storm. Your pictures are phenomenal! Wow!! Check out those clouds! Amazing shots. Hey, did you get a new camera? ;) I'm loving it too! Aren't new toys the best!?! You have lovely flowers, and the butterflies definitely seems to agree. Have a great weekend!! Great, great pictures of clouds. Did you see the one on Facebook circulating that was in the shape of a dog? It was amazing! You're a great photographer - keep it up! I love clouds too and your shots are spectacular! All of them. What a great camera! such gorgeous photos! i think your pups are adorable too :) found you on Two Little Cavaliers blog hop! Love the photos your new camera is taking!! Beautiful! I've been on the hunt for a good camera, this one looks great! Wow I love all of your pictures. I have huge camera envy. I have a coolpix s630, a compact cameral. I love it, but I wish I had a more "muscle bound" cameral like the p500. Opie and the rest of the boys are somewhat annoyed w/ their mom's camera obsession. Just got a new Sony bloggie to take quick digital movies. But now I have a new thing to put on the list for Santa. Excellent photos!